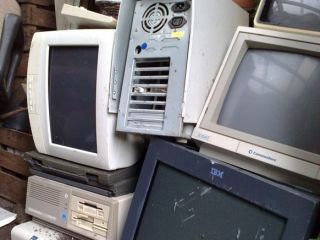 The European Parliament has laid down plans that will mean large electronics retailers are required by law to accept old equipment for recycling. The plans are part of a revision of the Waste Electrical and Electronic Equipment Directive that will be set in motion over the next seven years. Electrical stores with a shop floor of over 400 square meters will be affected by the rule, which will mean they have to accept small items like mobile phones without requiring customers to buy a new one to qualify. Backing the new rules, E.U. Environment Commissioner Janez Potočnik said: "Proper treatment of WEEE is important to prevent harm to human health and the environment, and its systematic collection is the precondition for professional recycling of the valuable raw materials like gold, silver, copper and rare metals, contained in our used TVs, laptops and mobile phones." The EU is aiming to get 85 per cent of electronic waste collected and appropriately treated by 2020. Illegal exports of e-waste are also being targeted by the ruling, tightening the controls on harmful non-functioning electronic goods being sent overseas for disposal. Green member of the European Parliament, Michalis Tremopoulos adds, "It is long overdue that we stop making developing countries the dumping ground for our hazardous waste."